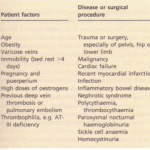 The incidence of various cancers varies with geographical tion. England, Scotland and Wales in fact have the ighest death rate from malignant disease in the world, mainly as a result of the very high incidence of lung cancer. Breast, colon and prostatic cancer all have a low incidence in Asian countries compared to Europe and North America. In contrast, liver cancer is very common worldide but is rare in Europe and North America. Many of these geographical differences are due to environmental factors; for example, people who move from countries with a low incidence of breast and colon cancer to countries where the incidence is high eventually acquire the cancer incidence of the country to which they have moved. Japanese people moving to North America acquire the incidence of colon cancer typical of North America within one generation but take two generations to show an increase in the incidence of breast cancer. These changes in incidence can be due to infective agents. Age has a strong influence upon the incidence of most common cancers. For lung, breast and colon cancer the frequency rises with increasing age; for Hodgkin’s disease, a bimodal age distribution is seen, with peaks occurring in early adult life and in old age. Environmental factors Some causative factors that have been associated with an increased risk of cancer are shown. It could therefore be concluded that most common cancers in the Western world are potentially avoidable. TOBACCO. 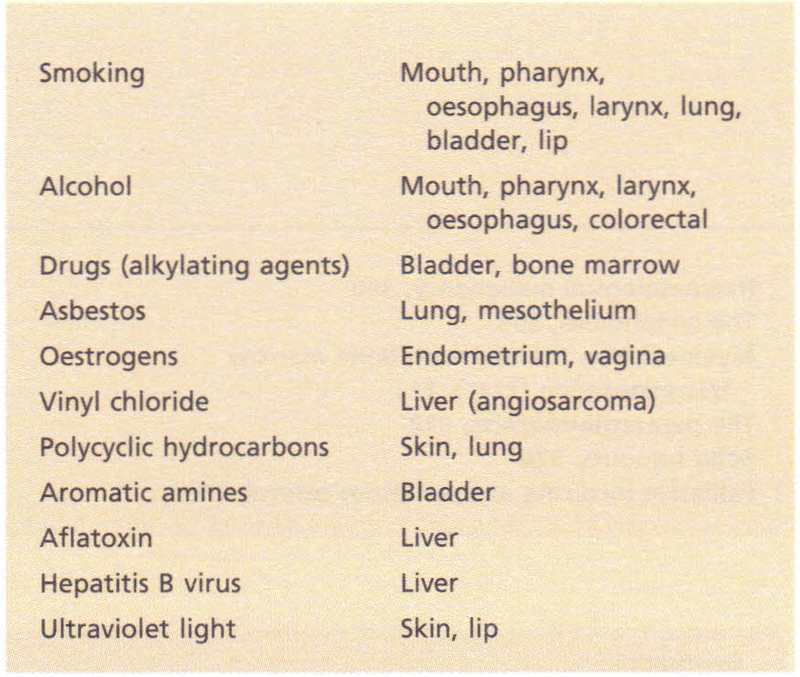 Smoking is associated with lung cancer but also with cancer of the pharynx, oesophagus, bladder, pancreas and cervix. There is also evidence that the risk of lung cancer is influenced by an interaction between tobacco and exposure to other agents including asbestos, radon (in uranium miners) and nickel. ALCOHOL. 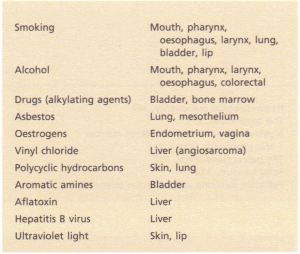 Alcohol is associated with cancers of the upper respiratory and gastrointestinal tracts but also interacts with tobacco in the aetiology of these cancers. Alcohol may also increase the risk of breast cancer. development of cancer at different sites. DIET. There are large international differences in dietary fat intake which correlate with the incidence of cancer of the breast, colon, ovary, prostate, endometrium andpancreas. However. these correlations may be due to other differences in life-style. Gastrointestinal cancers in particular have been associated with dietary factors. Conversely increased dietary fibre may protect against colon cancer. Food contamination may also play a role, e.g. aflatoxins found in mouldy peanuts and grains. ULTRAVIOLET (UV) LIGHT is known to increase the risk of skin cancer of all types (basal cell, squamous cell and melanoma). The incidence of melanoma is particularly high in areas of Australia, New Zealand and South Africa. Percival Pott, in 1775, first described the association between carcinogenic hydrocarbons in soot and the development of scrotal epitheliomas in chimney sweeps. Subsequently, other chemicals used in industry have been found to cause cancer, e.g. asbestos increases the risk of mesothelioma and lung cancer and vinyl chloride (used in the manufacture of rvc) causes angiosarcoma of the liver. Some of the agents known or suspected of causing cancer are listed. Some occupational exposures that influence cancer risk. Clustering of certain malignancies has been shown to be related to infective agents. A specific type of T-cell leukaemia, seen predominantly in the Southern Island of Japan and in the West Indies, is associated with the retrovirus human T-cell leukaemia virus: (HTLV-l) which is endemic in these areas; a high incidence of liver cancer is related to hepatitis B virus infection and Helicobacter pylori infection is becoming increasingly recognized as a causative agent in stomach cancer and lymphoma. The Epstein-Barr virus (EBV) has been implicated in Burkitt’s lymphoma and patients with AIDS due to HIV infection have an increased incidence of lymphoma and Kaposi’s sarcoma. The risk of cervical cancer is increased by early onset of sexual activities and by the number of sexual partners, suggesting that an infectious agent may be involved and there is evidence that papillomavirus is associated with cervical cancer. Oestrogens have been implicated in both vaginal and endometrial carcinoma. 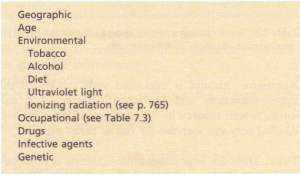 Cytotoxic drugs given. for example, for lymphoma, are associated with a subsequent increased incidence of secondary acute myelogenous leukaemia.